Does your child hate eating vegetables? Are mealtimes a constant struggle to get nutritious food into your fussy family? Do you have to beg, bribe or bellow to get your picky eater to take even one bite of healthy food? This book is filled with the best strategies plus fun, easy and practical ways to get your fussy child, and the whole family, to eat lots more vegetables every day—and love it. Even if all you want is some simple tips to get your family to eat better, this book is for you. It cuts through the confusion around healthy eating, provides compelling reasons why upping your vegetable intake is important and tells you how to avoid picky eating and food battles. almost impossible to actually get our children to do easily and consistently. This core conflict is the cause of misery and despair for parents everywhere. It is one thing to know what our children should eat and quite another to get them to actually eat it! I should know. After far too many dinnertime rejections, I thought there must be a better way to get my kids to eat healthy every day without the stress. So I read books, searched all over the Internet and surveyed other parents. Then I distilled the avalanche of advice into simple and practical tips to get kids to eat more vegetables and love it. Read this book and you won’t need to spend hours searching for information all over the Internet. You will have a clear direction and won’t be confused by conflicting advice. 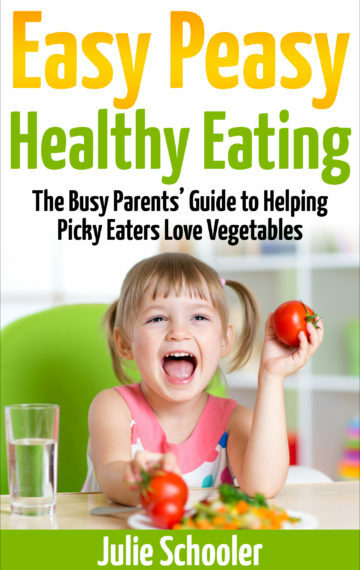 If you use even a couple of the tips in this book, your picky little eaters will eat more vegetables, mealtimes will be happier, and you will give your children the best gift of all—a long, healthy life. What’s stopping you from blasting your whole family into a healthier future today? Click here and you WILL increase your family’s vegetable intake – easy peasy! Easy Peasy Healthy Eating is part of the Easy Peasy series. These books provide simple and straightforward information on parenting topics so that busy parents don’t have to spend their time and energy getting conflicting, inaccurate and just plain silly advice.